The Blazers need more 3 point scoring, having lost to WAS. Blazers scored only 33 points by swish3s while WAS scored 45. The Blazers should have won this game against a weak eastern conference opponent. Shooting only 28% of swish threes is not enough. Furthermore we will need at least 130 points to win most games in the higher scoring 2018 season. Chief with 3 of 5 and Nick with 3 of 6 were the most productive swish3 shooters, and Mo and Seth were each 1 of 2. The Blazers need to play best percentage swish3 shooters which means Meyers and Nick instead of continuing the low percentage shooting of CJ and Dame. The plan needs to be that a player should stop attempting swish3s after missing 3 consecutive attempts. CJ and Dame were a combined 3 for 19 in the WAS loss. If 10 of those swish3 attempts were instead made by a 40-70% shooter, we would have 12-21 additional points and the win. Meyers and Nick can do this. I would like to see 12 or more points by each of them in each game. To be at the best this season, the Blazers need to bring the hottest shooting talent, keep the swish3 success percentage above 40%, and aim for improved (>130) points per game. Having the hottest scoring talent included is how to get the additional 12 or more points and wins. stampedehero, kjironman1, BlayZa and 6 others like this. swish3 and bodyman5000 and 1 like this. The Blazers need to play best percentage swish3 shooters which means Meyers and Nick instead of continuing the low percentage shooting of CJ and Dame. 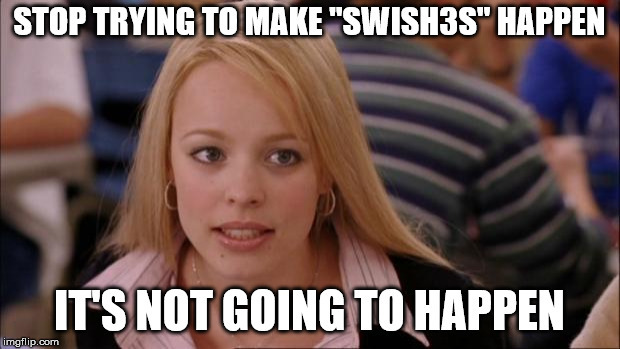 The plan needs to be that a player should start attempting swish3s after missing 3 consecutive attempts. Natebishop3, dviss1, Dougnsalem and 1 other person like this. Do you know how much entertainment you bring? kjironman1, Orion Bailey, Natebishop3 and 5 others like this. I think by the end of the season we’ll see that the Blazers have plenty of swish3 scorers. A cold start to the season doesn’t mean it’s going to stay that way. Chris Craig, Strenuus and ripcityboy like this. SlyPokerDog and swish3 like this. They needed to not leave morris open and for CJ not to play like a full diaper. dviss1, oldmangrouch, Chris Craig and 3 others like this. Getting 3pt shots off is a skill, one that Meyers doesn't have. So you can't assign shot selections. Swish3 shooting is definitely a skill. The facts are that Meyers is the highest percentage swish3 Blazer if you check the statistics. We need Meyers, Nick, and any other Blazer shooting 50%+ to be taking swish3s, especially in the 2nd and 4th quarters. Weak scoring in the 2nd and 4th quarters held the Blazers back and lost games last season. Let's not repeat that flaw this year. There's a difference between being able to make threes and being able to get 3pt shots off. Dame and CJ are able to get good 3s off all the time. Meyers needs 15 feet of space to do so. Meyers.needs more space, but only 3 feet, and can find it, as preseason and playoff games document. Remember the SAC game a few weeks ago. When the Blasers have multiple swish3 threats in the game, we can score like--and even beat--the Warriors. Meyers shoots his standing swish3s with a Blazers best accuracy. That deliberate shot is just what we can rely on, as the Bball Reference numbers show. Who else will achieve 70% swish3s shooting? With good setup passes, and good reciprocal feeds between Meyers and Nick, the Blazers can expect an additional 12 points per game. The Blazers beat the Magic Oct 25 with great performances by Dame and Zach, with notable play also by CJ, Jusuf, Evan, and Zach. Swish3s were scored by Dame (5 of 10), CJ (2 of 3), Zach (2 of 2), Jake (1 of 1), and Seth (1 of 2). This was a great game for Dame, who scored 41 points and had only 1 turnover. There was also some commendable defense by Zach, Jusuf, Evan, and Chief. Let's continue the wins and aim to score 45 or more as swish3s each game. stampedehero, Orion Bailey, andalusian and 5 others like this. Yes. We only had 11 swish3’s tonight. We needed to have 15.